How to compress MOV file to MP4 on PC or iMac? There aren’t that many really popular video formats, and MOV is one of the leading contenders. The incompatibility of formats between different platforms and devices can still be a problem for many users. For example, big file size of mov recorded from camera/camcorder is hard to be played and your devices has limited storage space. And if you want to convert files to other equipment for editing, such as Avid Media Composer, Windows Movie Maker, Sony Vegas, Adobe Premiere Pro, Android/ Apple devices, or playing on computer，what to do? The easiest way to resolve this problem is to compress MOV files to another file type that is more widely supported by devices and operating systems, such as MP4 (MPEG-4). Read this tutorial on how to compress or convert MOV to MP4, then install the program and give it a try yourself. We highly recommend you Pavtube Video Converter, the best video movie compression software to help you compress MOV file to MP4 for editing and playing on Windows. If you are running on Mac, you can turn to the equivalent version Pavtube Video Converter for Mac. There’s also a Free MP4 Players for Windows/Mac. If you want to learn more, please read. Step 1: Download and install the corresponding version. Click “Add video” on the main interface to load MOV files to the program. You can also drag the files to the program’s window list directly. This program can also support the batch video clips. Step 2: Open the list of supported formats by clicking the convert to section. Locate the collection of MP4 presets and select the one that will work best for your target devices. Step 3: If you want a smaller size when the free apace is not enough, you can click "Settings" to adjust Bitrates (kbps) and Size (pix). Choosing a little lower Bitrates and Size will help you to get a smaller target file, but it also leads to a lower video quality in saved file. Don't forget the balance between video quality and size. Step 4: Click the “Convert” button to start compressing MOV files to MP4. 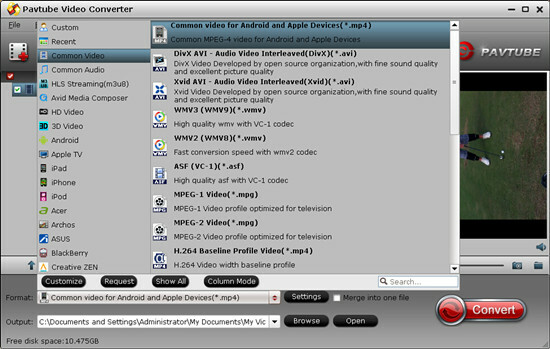 After the conversion, click the ‘Open’ button to locate the output files and transfer the files to other equipment for editing or playing on computer. The guide is very simple. If you want to learn more, you can see more products on our official website.